Maximise leasing opportunities with speed and automation. 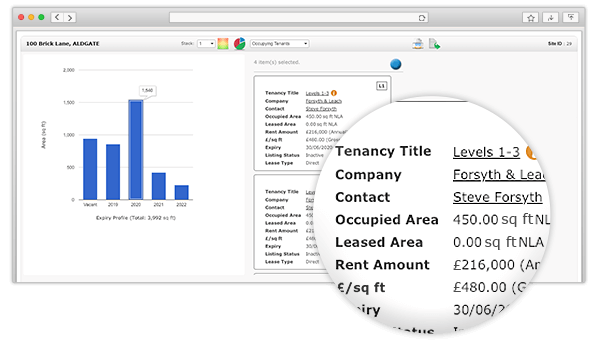 Build a comprehensive database of commercial tenants and associated lease information in an organised and highly professional manner. Store key lease events including expiries, break clauses and rent reviews. Stay proactive and secure future leasing opportunities by receiving automatic alerts prior to lease events taking place. "The ability to record and share information internally means everyone in our team is up-to-date and we are maximising potential sales and lettings deals." Surga Central’s stacking plans, tenant mixes and lease expiry profiles provide a visual, interactive way to analyse commercial asset performance and will revolutionise the way you engage with owners, investors and prospective buyers. For more information, see the interactive stacking plans page here.